There’s only so much a manager can do about a top-heavy bullpen. Rocco Baldelli, much like his predecessor, seems to be taking the approach that a bird in the hand is worth two in the bush. He’s opted to use his top guys to secure a win at hand and worry about the two games in the bush later. Or, something like that. I understand that strategy, why risk losing a game in hand just to try to plan for something that may not happen later? Make sense, but it can also lead to trouble. With Taylor Rogers, Trevor Hildenberger and Blake Parker having all pitched both of the previous two games, it figured that Rocco was going to have to dip a little deeper into the pen tonight. Perez did everything he could to help, needing only 86 pitches to get through six innings. Baldelli decided that was enough for Perez, who had only thrown 44 pitches in his most recent appearance. Ryne Harper pitched a perfect seventh inning (more on that in a moment) before Mejia took over in the eighth. Single, double, RBI single, three-run home run. Also, those were all hit by right-handed batters (and Mejia is, of course, a lefty). Perez looked good in what was kind of his second Twins debut. He entered this season with just 13 career bullpen appearances, but he was forced to pitch out of relief due to the extra off days. He didn’t look especially good in those outings. An important thing to remember is that Perez was brought in to be the fifth starter. He’s not expected to be the savior of the rotation. The front office didn’t commit an exorbitant amount of money to him. He just needs to be competent. Anything extra would be a bonus. The especially encouraging part of Perez’s outing tonight wasn’t his increased velocity, but that he was throwing strikes. If he can get into pitcher’s counts and limit walks, he’s going to be an asset. Perez has always had good velocity, but it’s never translated into missing bats. Tonight, he got five strikeouts and eight swinging strikes. Another encouraging sign. It would be fair to point out this Toronto lineup has been among the worst in baseball, but remember, all Perez really needs to do is be a fifth starter. Ryne Harper pitched, which means I got all sorts of warm fuzzies. He pitched a perfect inning and struck out two batters. He threw 15 pitches, 10 of which were curveballs. That pitch ranged from 72.6 mph to 67.5 mph. It’s a little like watching a knuckleballer in that anything he throws outside of that signature pitch is a surprise. The 30-year-old rookie has given up zero earned runs, two hits, two walks and has five strikeouts in 4 1/3 innings. I don’t know how long this ride is going to last, but I’m going to enjoy every last bit of it while it does. The guy is really fun to watch and it’s a great story. Byron was doing his thing again, making an outstanding catch in the first inning. After hitting a laser line drive for a homer yesterday, Cron blasted a majestic, towering shot for another home run tonight. Baldelli got ejected for the first time in his managing career. It was maybe the least entertaining ejection I’ve ever seen. He spoke on the issue during his postgame interview. Wrong guy (Mejia) at the wrong time. Got stale waiting to be used. What's Vasquez doing? Knitting a sweater? Missed the game as I was watching the Game of Thrones episode recorded last night....but reading the summary, it appers the walkers from beyond the north wall got to the Twins bullpen? Twins haven't had too many games where everything is working. In both wins and losses there have been some poor performances (starters, bullpen, or offense). The good news: if it all comes together, this team can be really good. Is the shine coming off Astudillo a bit? 0 for his last 10 or something? His last hit was against de Grom if I recall correctly. I kind of liked that he left Mijares in. Never quite understood taking guys out right after the damage is done. At least he saved the pen an inning. Next three guys were all righties and went down in order with two strikeouts. Timing. Anyway, all relieers give up runs. Tough one to lose but we were out hit 11 to 5. All or nothing swinging is great when its all. Not so great when it is nothing. Get em tomorrow. Buxton is not going to last if he keeps doing that every day. He's going to get CTE from hitting his head on the wall that many times. I would say something cheeky about the bullpen, but I think we have already done enough of that. The FO has reaped what was sown by adding just a single new arm to the 'pen. It's hard to blame coaches/usage when Mejia was handed a 2 run lead and a clean inning. The problem with tonight is clearly that WE DID have the bullpen to close it out.It didn't take a genius to figure out how to get the last nine outs from some combination of Perez, Harper, May, and Hildy. If Perez, May, and Hildy were considered off limits tonight, it's going to be a long year and perhaps the FO should've have thought about signing one of the four hundred thousand 7/8/9 relievers available. Harper was fun to watch. I wonder who will have staying power. Harper or the Turtle.Both? Neither? Two warning track flies and a lineout for Astudillo with a phenomenal defensive play. Astudillo is fine. Pretty worrisome that Rocco thinks the bullpen is overworked on day 3 of nearly 39 straight games when the starters all had quality starts. Extremely worrisome for the future. Neither may nor Hildenberger had pitched much but it looked like he was saving Hildenberger and that he’s already lost faith in May. If my count is correct he only has faith in two relievers now 13 games into the season. We’ll likely be seeing 10 of these blown saves the next 40 games. Why do I feel like Tyler Duffey will be making his 965th trip back to the majors soon? Hm. The bullpen is gonna be an issue. We need some reinforcements. Also, they shoudl paint roadrunner/WilECoyote-style outlines on the outfield wall for every time Buxton has slammed into that thing. Also, they should get some 3M engineers working on padding it to the maximum extent legally possible. I would have used Vasquez, but that is nitpicking.I also understand you cannot use the same pitchers all the time.It is one game, but I wonder why Mejia is still on this club as he does not seem to be a fit. Mejia not having options is going to mean that they keep throwing him out there. Hes got another 3 or 4 weeks of this before he shows he can be effective out of the bullpen or test waivers. Meanwhile, Nick Anderson and Nick Burdi are killing it for other teams. How about trying Eades and Reed before you lose them for nothing. Instructions: After running headlong into a wall, take two aspirin. Repeat if needed. Wait...Byron, that doesn't mean run into the wall again! That is a sublime curveball that Harper has been throwing. I wonder why Harper couldn't throw two innings in such a case. He hardly got warmed up and was finished with the side. Game was managed as if they can afford to lose this game. You've had, what, eight off days in the first two weeks, and you're already got your key bullpen guys on ice? Don't know if this is Baldelli or Falvine, but it's frustrating that there was the need to dump a potentially helpful bench/part time bat (Austin) in order to get another reliever to get them through a first-week-of-the-season road trip (a seven-gamer with three off days), then have both of those "extra insurance" relievers pitch precisely like minor leaguers. Relying on Blake Parker as your ninth inning guy? I've already had it with him. Then you bring in a lefty to face all righties?? These moves make no sense individually and less sense big-picture-wise. I understand not wanting Kimbrel, and maybe they really wanted a Soria/Robertson type and just got turned down, but relying on the current group isn't exactly what contending teams do, what with the uber-importance of bullpens in today's game. The top thing I was worried about was Rocco’s injury history as a player and it seems to be playing out exactly as I feared. He is deathly afraid of overworking anyone because his career was derailed by injuries so he is babying everyone, giving them days off when it’s not needed when they’ve all had plenty of days off already. I never understand why when a reliever is dealing it like Harper was tonight, why the manager doesn't let him just keep dealing. He only threw 15 pitches and hasn't pitched forever and could have easily gone another inning. Ride the relievers that are doing well while they're doing well. 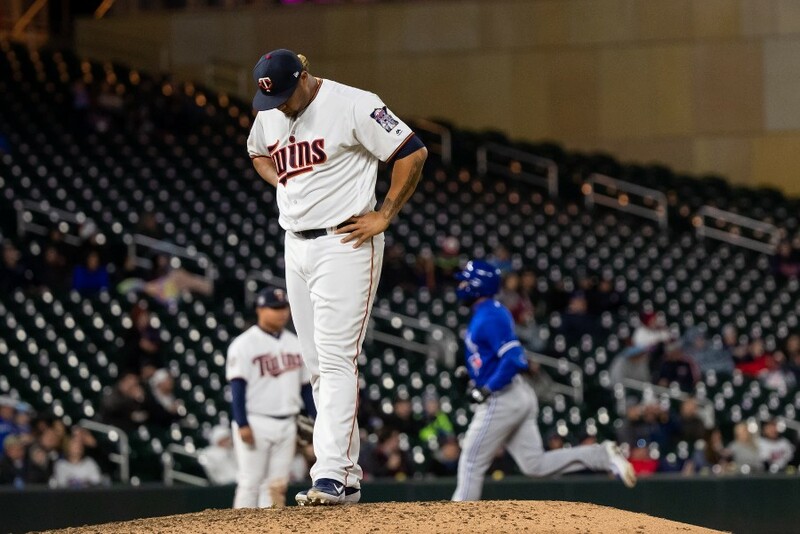 I understand everyone’s frustration with the bullpen, but I’d remind you all that Mejia is a starter that they moved to the bullpen because the rotation was full and he was out of options. His is a pitcher that the organization values and does not want to loose. As such he is a guy who should be able to get out both leftie and rightie batters. Also, Baldelli saving arms is not something people should be complaining about, killing the reliable bullpen arms is part of what got Molitor fired. I do have to agree with those wondering why they didn’t let Harper come back in the 8th. I am wondering about Vasquez vs. Reed or Eades though. I only was able to watch the ninth inning and Mejia looked very good.So he had one bad inning.There are still 145 games left (more or less). 37 games in 38 days.This bullpen will get exposed and there is nothing anyone can do about it.The frustration level of this group will accelerate over the coming days.We can afford Kimbrel easily for two years. He has to be interested based on this team's start.If he wants 4 or 5 years? That's a tough call because you will probably hate him the last two or three years of that contract.But, I say do it if you can get him for 4 or less. It’s also easy to criticize Mejia and lack of usage when they only play a game every other day. I really hope the schedule makers get their act together. No reason Houston & Tampa play a series in first week of season. You go back and watch that 8th inning, Mejia kept throwing the slider and it didn't have much action, just a gentle slope into the middle of the plate. In the 9th, he relied on his fastball, which was sitting 95 and he could control to both sides of the plate. Garver was a little slow to realize the slider was not working. But, really, the offense has to put more runs up. Listless. Definitely a night they needed the Sano-man. 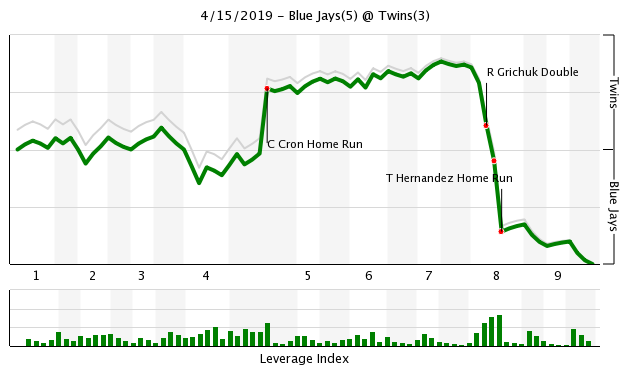 Somewhere else across baseball a reliever blew a lead yesterday... it happens. Baldelli is mixing in his players...he is utilizing his pitching staff. Anything less than a 0.00 ERA from this bullpen is unacceptable! Okay, that was sarcasm....seriously, would you prefer the Twins' starters just give up the runs instead? Losses happen. Mejia didn't look good, end of story. Maybe we should start looking at the Twins' bats? The most recent issue is that they seem to only score in one inning per game. Putting up crooked numbers are great, but if you take away a few big innings from the offense they'd be virtually scoreless in the past week. Would like to see the offense start adding a run here and there and not just rely on 3-run HRs for all of their offense.